We all want to go to Vegas at some point, but to plan a trip all the way there isn’t always possible. That’s why Sector 29’s Vegas 99 is our new go-to place. Why? Because it’s everything Vegas, but it’s located right here in Gurgaon. Vegas 99 has been created thematically to make you feel like you’ve just arrived in Las Vegas – and it really lives up to the theme. They welcome you with a big sign that says ‘What Happens In Vegas, Stays In Vegas’, and that’s when you know you’re in for a really good (not to mention authentic) time. The ambiance will give you that Vegas feel with flashy lights, playing cards and even table tops that look like card faces. And, if that’s not enough, their great range of drinks (they’ve got amazing beer cocktails) presented in fancy ways will help you sit back and enjoy the party life. The menu here has a little something for everyone as well, with a great range of Italian, North Indian and Continental dishes. 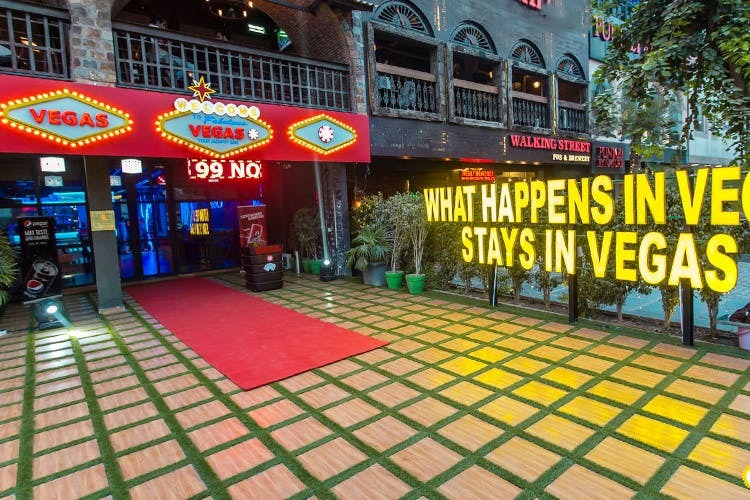 It’s alright if your Vegas trip isn’t anywhere near happening – Vegas has come to Gurgaon, and it’s going to be one hell of a good time. We finished our meal with the Japanese Fluffy Cheesecake, which is rich and served with charcoal ice cream, and walked out with a happy, fuzzy feeling.